Children's Hospital Los Angeles provides a welcoming environment for patients and their families. Friendly volunteers greet you when you enter our child-friendly lobby. The lobby design was donated by Disney Imagineers and incorporates natural light, fun play areas, and access to our gardens. Everyone at our hospital has the sensitivity, compassion, and medical expertise to work with children. It is not uncommon for the faces of our patients to brighten upon seeing that their favorite nurse or doctor has entered the room. In addition, we offer many supportive services designed to alleviate the stress of hospitalization both for our patients, and for their family members. We invite you to explore these programs online. What better way to symbolize that this is a hospital for children than having a play area featured prominently at the entrance! 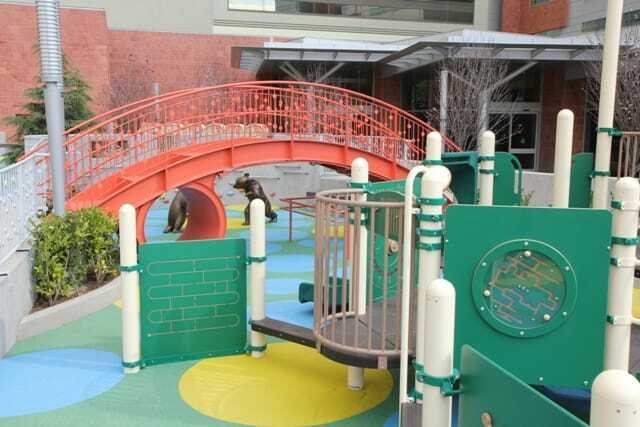 The Jane Vruwink Palmer Healing and Play Garden is about a third of an acre and includes the Simms/Mann Family Foundation Playground, a universally accessible playground featuring a play structure, an interactive activity wall, a sensory ocean wall, sound play with musical instruments and playful bronze sculptures. The Joyce and Stanley Black and Family Healing and Meditation Garden is easily accessible to patients, family members, and staff. All three groups use the space which was designed with a child’s recovery in mind. Plants and trees in the garden were chosen for their low-allergen qualities. A seed planting area is used for patients who need to develop their fine motor skills. A maze in the middle of the garden has been designed with uneven stones to help children who are relearning how to walk or are honing their balance skills. Tiles painted by patients are integrated into the garden walls. Patient poetry graces the benches. Electrical outlets suitable for intravenous poles have been integrated throughout the garden so that all children who are able to enjoy the garden are able to do so. Along with a grass area for children to play and explore, the gardens incorporate several bench areas where families can enjoy a picnic outside. Staff often take their lunch outdoors to enjoy the bright Los Angeles sunshine, or enjoy a quick break with their fellow colleagues outside before attending to their next patient. 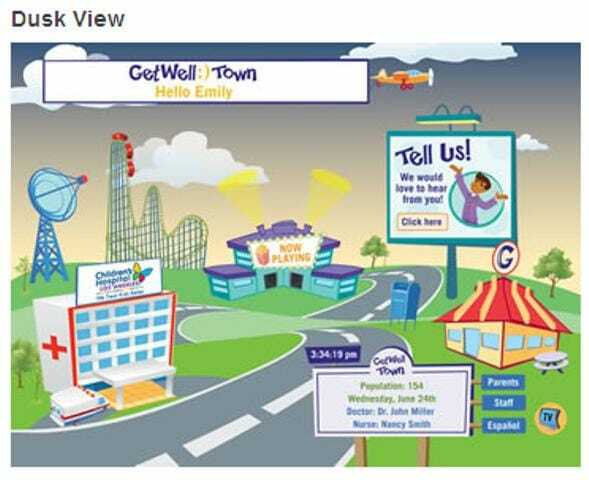 The GetWellNetwork is an interactive bedside system that is designed to help ease the recovery process for children and families while engaging and empowering parents, kids and teens while they are receiving care at our hospital. access information about our hospital. Parents can use the system to watch educational videos about their child's diagnosis.